The photo shows a group of members at a session at our current location in the conference room of the Gover Centre at the rear of the Rutland Volunteer Centre. Oakham Art Group meet each week on Monday afternoons except Bank Holidays in the Gover Centre at Rutland Volunteer Centre (Rutland Community Hub) in Lands End Way, Oakham LE15 6RB, from 1.30pm to 3.30 with a break for tea/coffee. The centre has a car park and disabled toilet. 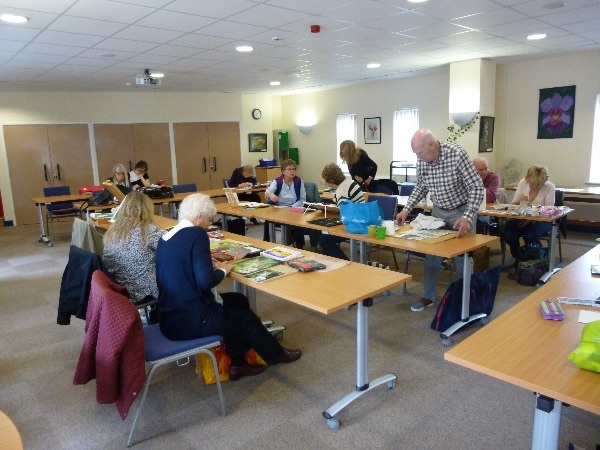 Members share common experiences, advice and inspirations without a tutor in attendance, but periodic tutorial demonstrations are arranged with local professional artists on topics of common interest. Enthusiasts for en plein air painting at outside locations can also be catered for as weather permits if sufficient are keen. Membership is limited to a total of 30 to enable us to get together in the one room. There is no entry assessment but for membership or general enquiries please use the CONTACT US option above. Membership subscriptions are currently £45 per half year payable in April and October, but a first trial Monday session is free of charge.